Vardhamana Mahavira was believed to have born in 540 BC in Kundala Grama in Vaishali the capital of Vajji. Now it is in Mussafar district in Bihar. He belonged to Jnatrika Kshatriya clan. Mahavira’s family was connected with the royal family of Magadha. The word ‘Jaina’ was originated from the word ‘Jina’ which means conqueror. Jainism speaks about 24 thinthankaras. 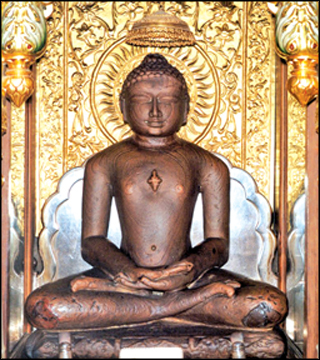 Mahavira was the 24th Thirthankara, who is considered as the founder of Jainism. Rishabha was the first Thirthankara. Neminath and Parswanatha were the 22nd and 23rd Thirthankaras respectively. Bhagavatapurana, Vishnupurana, Vayupurana,etc mentions about Rishabhadeva. Sidhartha, ruler of Nandadynasty which ruled Kundalapuri, was the father of Vardhmana Mahavira. Mahavira’s mother was Trissala and Yasodha was his wife. Jameli was the daughter of Mahavira. Mahavira is also known as ‘Vaishalia’ as he was born in Vaishali. He got Kaivalya at the age of 42 under a Sal tree on the bank of river Rajpalika near Village Jimbhrikagrama. At first Mahavira followed the practice of an ascetic group called Nirgrandhas , which earlier led by Parswanath. Makhali Gosala was a companion of Mahavira, Who later founded the Ajivika sect. Mahavira attained Nirvana at the age of 72 at Pavapuri near Rajagriha in 468 BC. Jains observe the day of his nirvana as Dipavali. Gautama Indrabhuti is considered as his first desciple. Jain sacred texts are called Angas. Jain texts were written under Bhadrabahu in BC 296. Jain texts were written in the Prakrit language of Ardhamagadhi. Jain Temple at Sravanabelgola in Hassan district in Mysore is known as ‘Kasi of the Jains’. Names of Rishabhadeva and Arishtanemi are also mentioned in the Rigveda. Chandragupta Maurya the founder of the Mauryan Empire, abdicated the throne towards the end of his life, accepted Jainism reached Sravanabelgola and died there. ‘Ahimsa Paramo Dharma’ is the sacred hymn of Jainism. Ahimsa, Satya, Asateya, Aparigriha and Brahmacharya are the five major principles of Jainism. Brahmacharya is the principle added by Mahavira. Mahavira taught the three Jewels of Jainism(Triratna) - Right Faith, Right Knowledge and Right Conduct. The Jains repudiated the authority or infallibility of the vedas. The Jains rejected the concept of Universal soul or a supreme power as the creator and sustainer of the Universe. Jainism does not condemn the Varna system.Mahavira believed that all individuals irrespective of caste can strive for liberation through good deeds and living. First Jain council was held at Pataliputra in the fourth century BC under the leadership of Stulabahu. Second Jain council was held at Vallabhipur in third Century BC under the leadership of Aryaskandil Nagarjuna Suri. Third Jain council was held at Vallabhipur in Gujarat in 5th Century AD under the leadership of Devardhi Kshamasramana. Jainism was divided into two sects Swetambaras and Digambaras after the first Jain Council. Digambaras are sky-clad or naked and swetambaras are clad in white. Gomateshwara statue is situated in Sravanabelgola. ‘Syad Vada’ is a Jain philosophy of Knowledge. Kharavela of Kalinga gave patronage to Jainism. Mahavir Jayanti and Rakshabandan are the festive occassions of Jainism. Temple on the Mount Abu in Rajasthan is a famous centre of Jain worship.